How does language work? How do children learn their mother tongue? Why do languages change over time, making Shakespearean English difficult for us and Chaucer's English almost incomprehensible? Why do languages have so many quirks and irregularities? Are they all fundamentally alike? How are new words created? Where in the brain does language reside?In Words and Rules , Steven Pinker answers these and many other questions. His book shares the wit and style of his classic, The Language Instinct , but explores language in a completely different way. 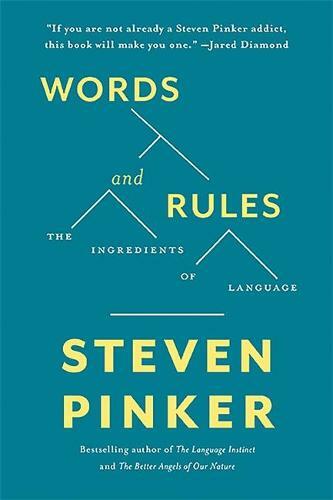 In Words and Rules , Pinker explains the profound mysteries of language by picking a deceptively simple phenomenon and examining it from every angle. The phenomenon,regular and irregular verbs,connects an astonishing array of topics in the sciences and humanities: the history of languages, the theories of Noam Chomsky and his critics the attempts to simulate language using computer simulations of neural networks the illuminating errors of children as they begin to speak the nature of human concepts the peculiarities of the English language major ideas in the history of Western philosophy the latest techniques in identifying genes and imaging the living brain.Pinker makes sense of all of this with the help of a single, powerful idea: that language comprises a mental dictionary of memorized words and a mental grammar of creative rules. The idea extends beyond language and offers insight into the very nature of the human mind. This is a sparkling, eye-opening and utterly original book by one of the world's leading cognitive scientists. Groundbreaking author of The Language Instinct, The Blank Slate and How The Mind Works, Steven Pinker emerged from the field of cognitive science to be recognised as one of the world's foremost and radical thinkers. Following his first five books exploring communication and the concept of language as an instinct, Pinker later diversified into human behaviour (The Better Angels of Our Nature) and the clarity of understanding (The Sense of Style).